The largest Russian oil company, Rosneft, which has fallen under sanctions imposed by the U.S. and European Union, has a total of $20 billion in funds, as reflected in its records. According to experts, this means that the company is unlikely to receive assistance from the state and will be able to service its debts with Western banks independently. State-controlled oil giant Rosneft had accumulated more than $20 billion in its accounts by mid-2014, according to the company's own financial records, reports a leading Russian business newspaper. According to RBC Daily, the company keeps more than half of this sum in dollar deposits, on which it earns interest. In addition to the deposits, the company invests money in stocks and government and corporate bonds. Experts say that the reports indicate the company is unlikely to receive the volume of support from the state that the company has requested due to the sectoral sanctions imposed on the company by the European Union and the United States. Rosneft has asked the government for unprecedented financial assistance to the tune of 1.5 trillion rubles ($ 41.4 billion), to be paid from out of the National Wealth Fund - a special state resources reserve, the funds of which are generated by the country's oil revenues. The issue is that Rosneft cannot raise credit with a maturity of longer than 90 days in European or American banks. "I do not see any prospects for the allocation of aid in the current situation," says Pavel Simonenko, the Director of Sales in the CIS Countries for Dukascopy Bank SA. According to him, even if the aid were to be allocated, it would not be in such a large volume. Rosneft is, of course, capable of servicing its own debts without the aid of the state," agrees Ilya Balakirev, chief analyst for the UFS investment company. Rosneft is currently the world's largest public oil company in the world, and it is also one of the biggest debtors. According to the company’s financial statements, at the end of the first half of 2014, its total debt stood at 2.1 trillion rubles ($60.2 billion). This sum mainly accounts for a syndicated loan issued to the company by Western banks. 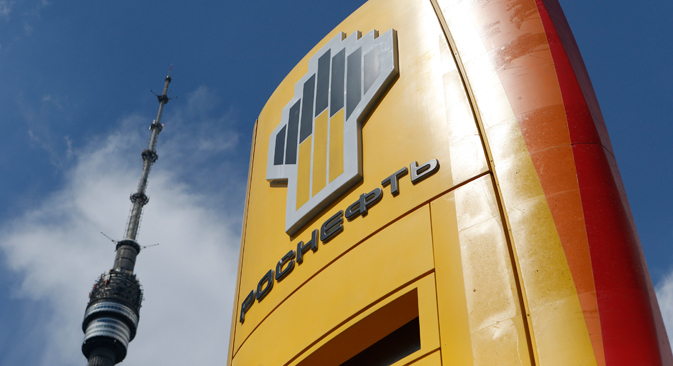 The next year and a half will be crucial for Rosneft: The company must return 440 billion rubles ($12.5 billion) to creditors by the end of this year - and another 626 billion rubles ($17.3 billion) in 2015. In the first half of 2014, the company paid 350 billion rubles ($9.7 billion) to Russian and foreign creditors. According to Ilya Balakirev, for Rosneft the issue is to a large degree about the cost of financing, which at this point is still extremely low but will inevitably grow in the process of refinancing. "In this regard, even advances from Chinese partners on oil supplies will cost the company more than the funding that Rosneft attracted for the purchase of TNK-BP, [the main source of the state-owned company's debt], so Rosneft was therefore initially extremely reluctant to mobilize this option," explains the expert. Rosneft’s loans were notable for their cheapness: In the first six months the company paid all of 26 billion rubles ($719,000,000) in interest. As a result, according to Ilya Balakirev, against the backdrop of sanctions which have practically blocked the company's access to Western financial markets, Rosneft is just searching for new alternative sources for fund raising – and the funds in the National Wealth Fund look like one of the cheapest. Now, however, as Ilya Balakirev notes, there are strong doubts as to whether the company will gain access to these funds.